Community service is is an integral part of what we do. ASG Chicago Chapter’s various neighborhood groups supply much-needed items to a wide array of charitable organizations based in the Chicago area that serve our community as well as those with national and international reach. Here are two of our projects for 2011. Our members also donate their skillsets for other local worthy causes. In April, our Community Services Chair was contacted by the American Cancer Society’s North Shore Regional Office to help provide some basic needs for breast cancer patients. American Sewing Guild members can help by sewing breast forms, “ditty” bags to hold the fabric breast forms, pillows and Anti-Ouch pouches. The Anti-Ouch pouch was also previously a national ASG community service. Links to patterns for all requested items are available online and free to download. To coordinate delivery of completed items, please contact Community Services Chair Marge D. via email. Additional information can be found on the ASG Chicago main website. You do not need to make all items; they are not distributed as a “set.” Feel free to make several of only one item if your fabric stash and sewing comfort level or time allows. You can read more information on our blog post. 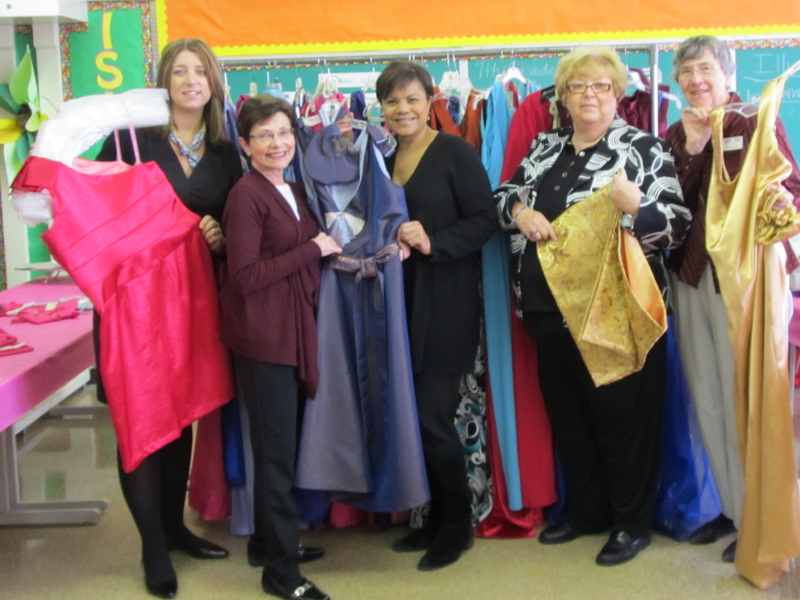 This year the ASG Chicago Chapter supported the Glass Slipper Project, an organization that outfits Chicago-area high school girls for prom. Our support includes donating the proceeds of book and pattern sales at our annual Fashion Show last fall, collecting gently-used prom dresses and accessories, volunteering in the alterations rooms at the Glass Slipper Project boutiques in April and the Curvy Girl Prom Dress Challenge, which has given many of our members a chance to play Fairy Godmother. We collected more than 210 gently-used prom dresses, 93 bras, 60 pairs of shoes, 49 handbags, a box of hair care products and assorted costume jewelry. Our members also made more than 30 evening bags, an assortment of wraps and our Curvy Girl Prom Dress Challenge yielded 25 dresses. Check them out! If you missed out on the excitement and creative energy this project generated this year, it’s never too early to get started on next year’s donations! The Glass Slipper Project has a chronic shortage of youthful, stylish prom dresses in large and plus sizes (22 and larger). The Glass Slipper Project has a particular need for evening bags next year’s prom season 2012. Neutrals such as black, white, bronze or silver are best because they give the girls more options to match with their dresses. If you’re looking for an easy, half-moon handbag pattern with no closures, here is a pattern available for download. The pattern is designed by allpeoplequilt.com and is not to be used for commercial purposes. Sew, what are you waiting for? Our members also contribute to the national community service projects sponsored by ASG each year. For 2011, the national ASG project is The Painted Turtle. Members can make the camping experience of seriously-ill children so much more special with their own turtle blanket. 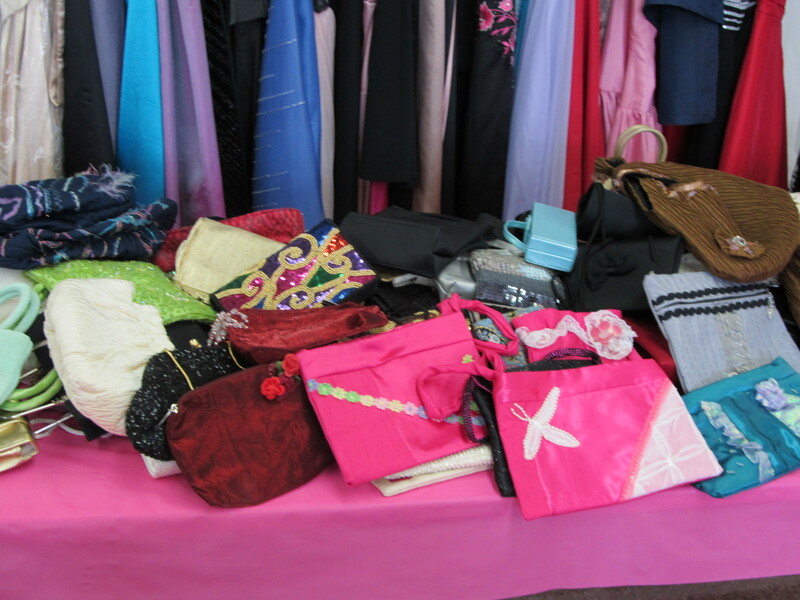 Marge tells us she has 70 prom dresses and a pile of evening purses waiting for the Glass Slipper Project! ASG Chicago is going to rock Prom 2011! Oops. I got the number wrong. Marge has 73 prom dresses, 11 purses and 10 pair of shoes!